Baekhyun and Loco are Rebellious in "Young"
Master collaborator, Baekhyun, and Loco, the rapper with an enviable discography, came together to release “Young” via SM Entertainment’s StationXO. Since its inception in 2016, SM Station has been a relatively successful project to release digital singles from various artists and create music fairly experimental in nature. With chart-topping collaborations under Baekhyun and Loco’s names, “Young”, released on 31st August, does not disappoint. Not only is the song powerful musically but its lyrics also resonate with its young demographic. Moreover, the accompanying MV makes one take a step back to stop and think. The factory-like setting and the relative darkness pervading through parts of the MV make the crux of the song inescapable. The drab, repetitive actions by the cast, the flickering tube lights, and the eerie computer screens make for a grotesque rendition of what our lives are actually like. The barricades surrounding the artistic space are a manifestation of the suffocation and are telling of the inability to break free from the chains that bind us. The freedom that comes with being young has been taken away by mechanical lifestyles and alienation has become the norm. “Young’s” atmospheric instrumentals and a succinct use of intermittent pipes, lift the song despite its low registers. Baekhyun’s versatility in being able to belt out high notes and harmonize with himself show his evolution as more than just an idol group singer. Unlike Baekhyun’s previous ballads such as “Dream” and “Rain”, “Young” provides a much-needed respite from the genre. Loco’s cadence makes the song interesting right at points when it feels like it is losing its momentum. Their harmonization at the very end was a nice surprise and I would have liked to hear more of it. The crisp production on the track doesn’t let either of the artists dominate, and gives enough breathing space for both to shine. The visual cues that the MV provides begin right at the basics—the color palette—and then follow through in a cascade. 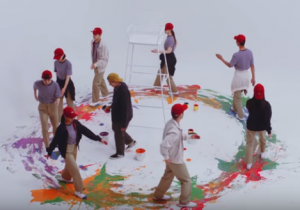 All characters within the MV wear identical clothing throughout. They’re all dressed in black and white stripes with black jackets for the women and beige ones for the men. Occasionally they change it up a bit but the gendered differentiation is maintained. Baekhyun and Loco, though, seem to maintain a semblance of individuality and wear bright primary colors. Loco’s orange beanie was especially striking! 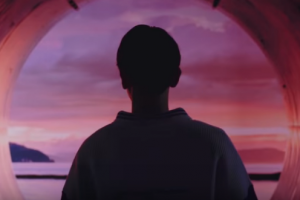 Also, Loco’s first rap verse sees the camera pan horizontally from a blank background to a rainbow colored one, just as Loco walks through a door. The juxtaposition of the colors makes the message of the song resound loud and clear- one has to escape the monotony and sameness prescribed by society to be free. Perhaps the most intriguing feature of the four minutes of the video was the peculiar logo on boxes scattered across the scenes- a minimalist figure of a pair of hands holding an orb. The imagery of the circle is recurrent and prominent. The supporting characters mold and remold a ball of plaster till it is smooth and spherical. This is an obvious reference to the uniqueness of the youth being stripped by norms and how individuality is nothing but an anomaly. The constant focus on the drawing of circles on blank sheets of paper is once again symbolic of the uniformity of our existence. 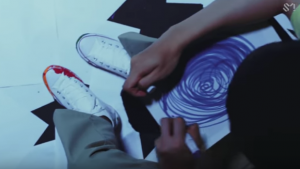 One of the most compelling shots was an aerial view of a person whose white sneakers were coated in orange paint but was still scribbling a blue circle on his sheet. During the rap segments, Loco tries hard to lend color to the blank canvas around him, literally, by spilling jars of paint on the floor. But the splotches of paint are turned into a dull grey by the constant circumambulation of people around him. The MV’s ending is probably its most optimistic feature. A brooding Baekhyun makes his way from a dark room to the outside world through a door that he opens. The focus on individual agency and its ability to guide us to freedom was thought-provoking. 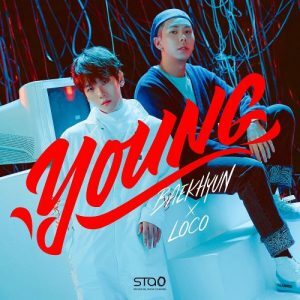 “Young’s” surprising success on music charts has established Baekhyun and Loco as a duo to look out for. This powerful collaboration has certainly grabbed my attention since it is a successful marriage between a strong social message and refined vocals. “Young’s” look and sound have definitely raised the bar for SM Station.